In version 2.8.9 ScreenSteps added the ability to specify the file name to use when exporting a lesson or manual to files on disk (e.g. HTML). 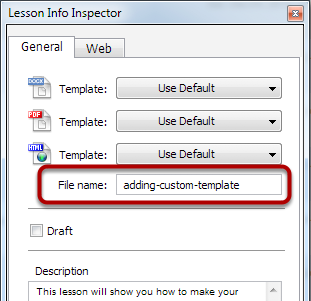 You can assign the default file name to use when exporting a lesson via the property inspector. Just select the General tab when a lesson is selected and fill in the File name property. Do not add a file name extension (e.g. .html) as one will be added based on the format you are exporting to. 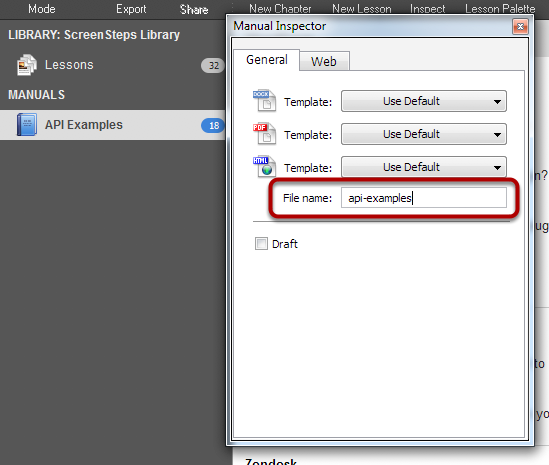 You can assign the default file name to use when exporting a manual via the property inspector. Just select the General tab when a lesson is selected and fill in the File name property. Do not add a file name extension (e.g. .html) as one will be added based on the format you are exporting to.